THE MUSCLE-ENHANCING FORMULA FOR FAST, OPTIMAL GAINS As an ambitious bodybuilder, setting goals becomes crucial for increased muscle gains. If you want to increase muscle size and have a healthy immune system, then ProteinCo Ajinomoto Glutamine is your solution. It’s possible with ProteinCo Ajinomoto Glutamine, as you’ll discover the meaning of massive muscle growth. You won’t have to worry about fading muscles or the inability to recover quickly. ProteinCo Ajinomoto Glutamine is the solution to reach your goals, no matter your current state of muscle size. Powered with Glutamine, this product is your answer to achieve quick, massive results. Increase Hypertrophy Glutamine provides additional energy to the muscles and nerve cells during vigorous training. ProteinCo Ajinomoto Glutamine enhances muscle size with its ability to repair, and build new muscle, that allows for rapid muscle growth. As Glutamine begins to deplete; fueling yourself with Glutamine supplements helps to increase muscle size during intense training---so you can experience significant gains in a short span. Repairs Muscle During intense workouts, your muscles are damaged. Glutamine helps you replenish your lost muscle---giving you a fuller, more defined look. ProteinCo Ajinomoto Glutamine gives you the ability to refuel low Glutamine levels so your muscles can grow quickly. Enhances Growth Hormones Protein Co Ajinomoto Glutamine helps generate hormone levels, and allows you to can see greater increases in hypertrophy, and boosts self-esteem---whether at home or at the gym. With the enhancement of growth hormones that ProteinCo Ajinomoto Glutamine provides, you will be able to break down fat quicker---and be on your way to a lean and a more defined body. ProteinCo Ajinomoto Glutamine contains 500 grams of L-Glutamine to help increase lean muscle mass. This muscle-building formula enhances rapid recovery, helps reduce inflammation, and boosts your immune system. Considered the most abundant amino acid, ProteinCo Ajinomoto Glutamine was made for rebuilding muscle after high-intense workouts. This supplement will help the body’s muscles from breaking down, which aids in muscle growth. As a bodybuilder, this high-powered amino acid is vital for improving massive results in a short amount of time. ProteinCo Ajinomoto Glutamine gives you an edge to overcome Glutamine depletion for optimal performance. Speeds Up Recovery One of 20 essential amino acids, ProteinCo Ajinomoto Glutamine helps speed up recovery after an intense workout. Glutamine helps maintain cell volume, which helps recovery and soreness---allowing you to be primed for a muscle-gaining workout the following day. By replenishing Glutamine levels after vigorous workouts, you’ll quickly see changes in your appearance. Boosts Immune Function When consuming ProteinCo Ajinomoto Glutamine, you’ll keep your immune system healthy and running smoothly---helping you to reduce illness so you can have continued workout sessions and experience lean muscle mass. Known as the primary energy source of the immune system, Glutamine helps stave off bacteria and infection. This will help promote high levels of energy for quality workouts. Q-Why we need amino acids to grow muscle? A – The majority of cells and muscles are made of amino acids. This substance is vital for proper cell structure. Their ability to send nutrients impact the functions within the body by helping the body heal, recover, and repair tissue. Most of our body is made of proteins, and it needs the right amino acids to fuel energy and build muscle. This is especially true for muscles, cells, and tissue. Amino Acids help to replace and refuel the body with nutrients being lost if not receiving the proper nutrition. This will help boost energy levels and improve daily functions. Without these essential amino acids, your body can become malnourished, which may cause a series of health problems as you age. As you participate in high levels of exercise, the body will break down muscle tissue. Supplying yourself powerful amino acids, keeps your muscles intact and helps sustain energy during intense training. Without this muscle-building supplement, your muscles will deteriorate, and you’ll feel lethargic, and unwilling to exercise. It is essential to eat high amounts of amino acids to slow muscle growth. Q – What foods help build muscle? A –One of the foods that you can eat to build muscle are eggs. Eggs contain grains in the eggs—which allows you to build muscle quickly. With six grams of protein, eggs are rich with in vitamins such as vitamin A, E, K, and B. Eggs contain eight essential amino acids needed for muscle growth and recovery. Also known to be good for building muscle are nuts. Nuts contain a unique combination of protein, fats, and fiber. Cashews and peanuts are convenient to carry around, and they are high in protein---helping to increase muscle mass. The impact of cottage cheese’s components includes Casein and live cultures. Casein’s amino acid levels rise, and they also contain live cultures---which are good bacteria that help enhance strength and build muscles quickly. Probably one of the most important foods for muscle growth is lean meat. Filled with essential amino acids, Creatine, and B-Vitamins are filled with healthy testosterone levels, and aid in muscle growth. In addition, Lentils are a muscle-building food that stays under the radar. Packed with 18 grams of protein and 40 grams of carbohydrates, they are an essential tool for bodybuilders. Furthermore, salmon contains high protein and is filled with omega-3 fats. Salmon helps muscle breakdown, and increases the muscle-building process. 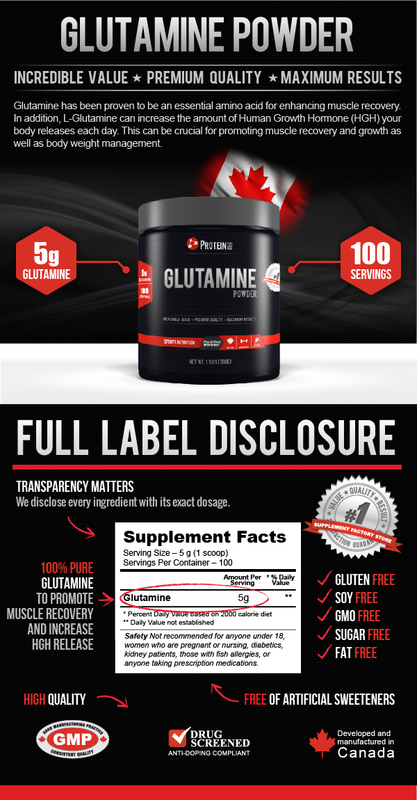 Manufacturing L-glutamine is manufactured by fermentation from carbohydrate sources. L-glutamine from Ajinomoto is manufactured under cGMP conditions. No ingredients of animal origin are used in the manufacturing process. A Drug Master File for L-glutamine from Ajinomoto is on record at the FDA. L-glutamine meets USP standards. Premium Quality - Strict manufacturing standards and certifications: With its ability to reduce body fat, ProteinCo Ajinomoto Glutamine offers a muscle-building formula that is manufactured to pharmaceutical grade specifications. We manufacture under strict GMP procedures to ensure the quality you require. 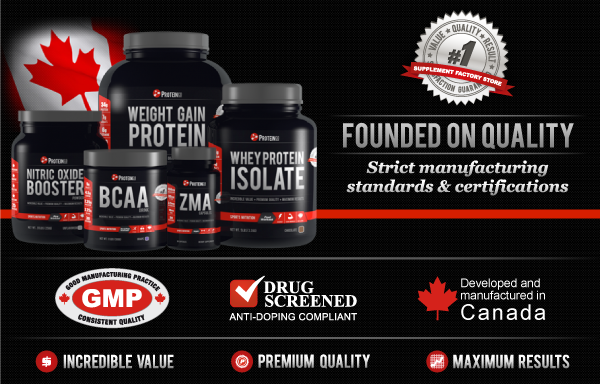 Our quality preserving processes means ProteinCo Canada’s ProteinCo Ajinomoto Glutamine features L-Glutamine which promotes athletes, everyday individuals and bodybuilders trying to stay healthy. Rapid Results with ProteinCo Ajinomoto Glutamine With 500 grams of L-Glutamine, ProteinCo Ajinomoto Glutamine is a great bargain to enhance lean muscle mass, boost immunity, and improve your overall appearance. This supplement will quickly transform your confidence levels, and allow you to see results quickly and effectively. Whether you are a competitive bodybuilder, or athlete trying to end muscle frustration, ProteinCo Ajinomoto Glutamine is your solution! This fast-acting supplement will put you “in the game”---to become the most talked-about physique in town. Timing 1 serving before a workout, 1 serving after a workout, and 1 serving before bedtime. Post Workout Protein Co Ajinomoto Glutamine can be used as recovery drink, and should be consumed IMMEDIATELY after your workout. It’s best to intake immediately after your workout---and no longer than a 30-minute window for optimal results. Daily Nutrition Protein Co Ajinomoto Glutamine is designed to be consumed regularly during training and competition. If you desire an energy boost prior to your workout, consume a few ounces 15 minutes pre workout. Then take a drink every 10-15 minutes during training and competition to fuel your body.